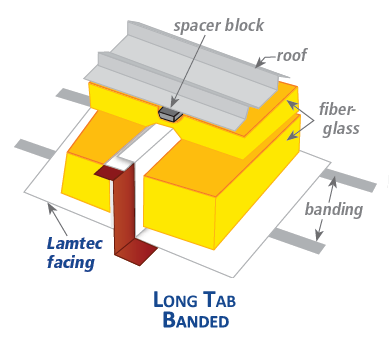 The Long Tab Banded installation method is also referred to as a "Filled Cavity System" (FC) in ASHRAE literature. Thermal testing of the Long Tab with Banding / Filled Cavity System was conducted in October 2010 and January 2011 at the Butler Manufacturing Research Center located in Grandview, MO, an independent certified laboratory. Finite Element Modeling was conducted by Engrana LLC, June 18, 2014. Testing was conducted in accordance with ASTM C1363, "Standard Test Method for Thermal Performance of Building Materials and Envelope Assemblies by Means of a Hot Box Apparatus."